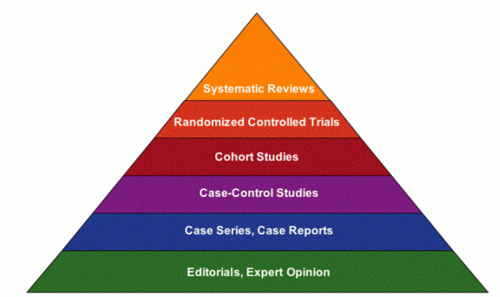 In evidence-based hierarchy, case studies come in the in the fifth level. Although they cannot be considered as guidelines, case studies are powerful material to share clinical experience and knowledge. You could write a case study to represent a typical or an unusual case presentation and share your successful program with your colleagues. There are general guidelines for case studies but if you are writing for publication you have to be aware of the journal's specific requirements. If you're writing a case study as part of Physioplus program assignment the following instructions will take you a step by step into the writing process. A case study should be limited to clinical relevant information. In order to eliminate unnecessary details begin by asking yourself a set of questions: what is my purpose of writing this article? what is my message? Then gather all needed information and search similar cases in literature to make relations. Try to keep interpretations on the development of the pathology and disease development as simple as possible and keep your article limited to proven facts. Throughout the whole writing process, you should support your case with evidence by citing information properly. Expressive and concise titles attract readers. Highlight the most essential keywords in your topic. A narrative abstract includes a summary of the purpose, case presentation, intervention and outcomes. Write your abstract after finishing the article. In the introduction, you give your readers an idea on the background of the case. Then discuss relevant cases and similar literature briefly. However, the most important aim of the introduction is driving your readers' attention to the purpose of your report. They should have a clear vision of your objectives. If there is anything interesting or challenging you met when diagnosing or managing this case, it's worth mentioning in the introduction. Here is where you mention the demographic data, nature of the condition and answer this question: why the patient sought your help? Try to use the patient's own words in describing the chief complaint. History-taking usually gives us lots of information but in client characteristics it's better to eliminate non relevant data. Inform your readers about the information that guided your diagnosis and directed your hypothesis. The patient is a 24 year old man who was previously very fit and well with no medical history. He was a semi-professional cyclist who also worked in a very physical job in a bicycle shop. Previously he would train for many months training for the race season and cycling was the centre of his life. He was knocked off his bike whilst cycling by a truck driver who was drunk. He incurred an emergency transfemoral amputation three weeks prior to the initial assessment with the author. What tests have you utilised to guide your decision and reach your final diagnosis? What results have you obtained from your examination? Were there any related observations? Give details on the tests and examination you have used and make sure they are valid and cited. You may want to describe the test application and response. Again, restrict yourself to relevant information and eliminate unnecessary details. If you are writing your case study on Physiopedia, you may want to link the test to a relevant page or add a video or an image of the test. If you are using an image for your patient(s), please respect their privacy and make sure to ask for permission before publishing. He had been a highly functioning young man previously, a semi professional cyclist and worked in a bike shop which was a very physically demanding job. His main objective was to return to the life he had.He was managing to independently clean, toilet and dress himself and was ambulating using crutches. He was not having any problems with transfers. Objectively, his transfemoral stump and wound were in good condition. He had no contractures and he had full range of movement at the hip and trunk. He had reduced strength of the hip, especially extension, adduction and internal rotation. His core muscles were weak and bridging was difficult. His sitting balance was very good, as were his pelvic movements but his standing balance was poor. He was able to transfer his weight side to side and forwards and backwards. His gait was very asymmetrical, with poor hip extension, hip hitching and trunk side flexion. From your findings on the physical examination, what decision have you reached? What helped you in clinical reasoning? Remember, your hypothesis should be supported with evidence. Mention your treatment goals and discuss your management program. Name your techniques, describe them in details and make sure to cite them properly. If you had to apply certain modifications to your treatment, write about them. A TENS machine was initially used to try to ease the pain. It was also important to massage the stump, continue the rehabilitation programme and to wear an elastic stump sock to minimize the volume changes. It has also been shown that there is a significant reduction in the intensity of phantom limb pain using mental imagery and mirror therapy can help to resolve the visual-proprioceptive disassociation in the brain. Therefore mirror therapy was also initiated with graded motor imagery. This is where the patient views a reflection of the intact limb through a mirror positioned where the amputated limb would have been. Gradually, movements of the intact leg were introduced. Report the degree of response and the tools/methods you've used to measure improvement or worsening. Also, here you tell your readers about your discharge plan or referrals to another healthcare specialist. The anti-neuropathic medication, amitriptyline, and TENS reduced the patient’s symptoms initially but the pain continued to impair function of the limb when doing exercises and gait re-education and was still affecting his sleep. The patient felt more in control of his pain, once he understood why it was occurring. When the patient started massaging the stump he felt that the pain diminished more but did not stay away. In the discussion, you summarise the whole experience and share you you have learnt. Discuss your hypothesis and support your theories with evidence. However, it's better to keep it simple and concise with regards to theoretical aspects. Your writing should end with a reference list. Only include references that you have used in your case. ↑ Budgell B. Guidelines to the writing of case studies. The Journal of the Canadian Chiropractic Association. 2008 Dec;52(4):199.